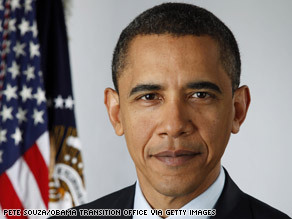 WASHINGTON (CNN) - Barack Obama became the 44th president of the United States at 12 p.m. ET Tuesday. He is the nation's first African-American chief executive. America is in Good Hands now-Thank God for Obama, Biden, and the millions who helped to make this day the greatest inauguration since George Washington was sworn in. What happened? No National Anthem? why did wolf blitzer talk over the john williams piece. it was so disrespectful. So happy to call him my president! Wow!!! What a country I live in. I am very proud America. God Bless You President Obama and Vice President Biden. We finally have broken a barrier! This is a glorious day! Each of us have music inside of us. We all possess a special and unique music that is no one else's but ourselves. For years, Black Americans were not given that chance to sing their music and they had to sing it behind iron cast doors. Many died with their music inside of them. Now, this day, African Americans and all Americans can rejoice and know that they can sing their music and let their stories be told. Peace and Love on Earth. WHAT A BLESSING!!! I AM SO HAPPY AND THANKFUL TO GOD FOR GIVING OUR NATION SUCH AN AMAZING GIFT AND THAT GIFT IS PRESIDENT OBAMA. THE EXPERIENCE IS SO INSPIRING, SO AMAZING. DREAMS REALLY DO COME TRUE!!!! I could not help but notice that Wolf Blitzer refuse to call President Obama; President Obama. He refers to him as he, him, or Barack Obama. As a matter of fact the entire team kept referring to former President Bush as President. "NO RESPECT" THEY ARE IN DENIAL. BUT GUESS WHAT? President Barack Obama is still President of the United States of America. I can now honestly say that I am Proud To Be An American! I'm so happy to see people from so many diverse backgrounds, races and religion come together for the common good of our country and making this a reality. Our futures and those of our children will be better for it. Thank God, thank America and thank you Barack Obama for seeing the vision and stepping up to the plate! Today is a beautiful day, now it's time to get down to business. Time to start putting people back to work, making some products that will benefit our export needs, and bringing our troops home. God Bless "PRESIDENT OBAMA AND VICE PRESIDENT BIDEN"!!! This is the day that the Lord has made, I will rejoice and be exceedingly glad in it. This is truly amazing!! America loves you Mr. President!! I am very proud that we have elected such an intelligent person to take control of our country and our people. I have nothing but faith in the man that we now call our President. God bless him and his family.